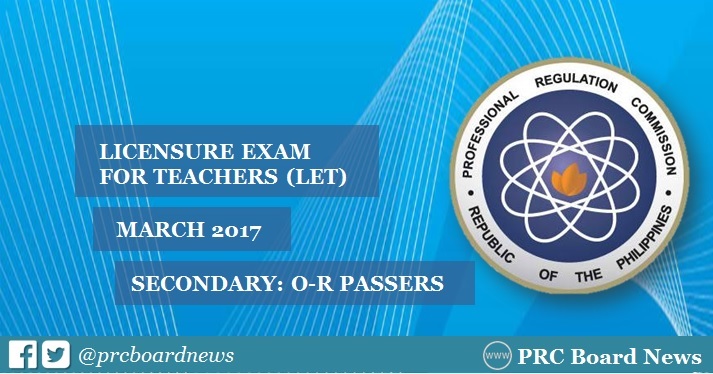 The Professional Regulation Commission (PRC) officially released on Monday, May 22, the full results of March 2017 Licensure Examination for Teachers (LET) also known as Teachers board exam. Those awaiting results can check here the complete list of passers with O-R Surnames for Secondary Level. UPDATE: 18,482 secondary teachers out of 72,584 examinees (25.46%) successfully passed the Licensure Examination for Teachers (L.E.T.) A total of 10,804 passers are first timers and 7,678 are repeaters. PRC together with the Board of Professional Teachers (BPT) have conducted the first LET this year on March 26, 2017 in at least 18 testing centers nationwide which include Bacolod, Baguio, Cagayan de Oro, Catarman (Northern Samar), Cebu, Davao, General Santos, Iloilo, Legazpi, Lucena, Manila, Puerto Princesa (Palawan), Rosales (Pangasinan), San Jose (Occidental Mindoro), Tacloban, Tuguegarao, Pagadian and Zamboanga. O-R: Roll of Successful Examinees in the L.E.T. Registration for the issuance of Professional Identification Card (ID) and Certificate of Registration will be from May 31 to June 16, 2017 for Secondary Level. 4) two sets of documentary stamps. You may also register at the PRC Service Centers in Robinsons Place Manila, Robinsons Galleria and in Clark Skills Training Center (formerly Polytechnic College, Clark, Pampanga).